The Photo Editor has many adjustment possibilities. There are basic adjustments like brightness, contrast, warmth and saturation. In addition, there are many other edits including stickers, drawing on the photo, adding text, adjusting redeye and even changing the photo to black and white and colorizing specific portions. There are also a number of filters to apply. When you complete the photo editing on individual photos, you can enhance the collage. The main enhancements are found by adjustments on the border of the collage. Adjust the aspect ratio of the collage to 3:2, 1:1, 2:3, Letter or a Facebook aspect ratio. Adjust the size of the outer border. For individual photo borders, adjust the size of the border, round the corners and create a drop shadow. 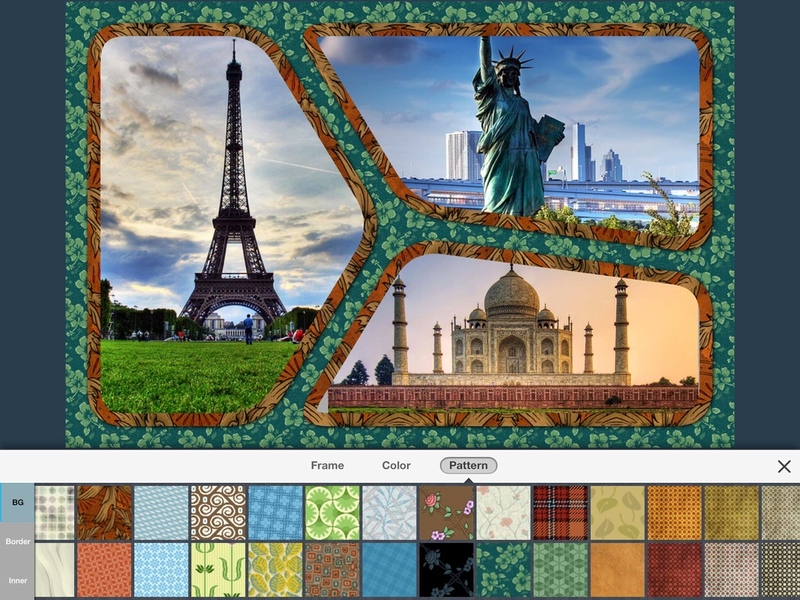 Select from a large variety of frames for the collage. Adjust the color of borders. Change the outer border color, the border around each individual photo, or even the inner border. Alternatively, you can place a pattern in any of these borders. Select from a variety of patterns. You can also add text and stickers to the collage as a whole. Share the collage on Instagram, text messages, Twitter, Facebook, Email, etc. Snap Collage is a fun app for creating collages. The Photo Editing capability rivals many general purpose Photo Editing apps. Another strength of the app is the large number of patterns and border adjustments. The only downside of the app, is it takes a little exploring to discover all its capabilities. Download Snap Collage in the App Store. It’s a free app with a number of upgrades available as In-App purchases.